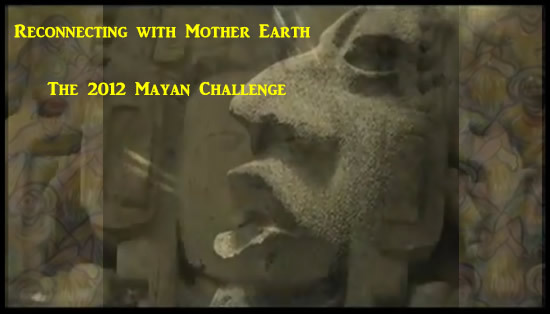 As the world keeps an eye on 2012 and the end of the Mayan calendar which signals the end of another sun cycle, we must look to the living Mayans to see what this really means. For some this prophecy means a blip of tourism, book sales, and maybe some survivalist hoarding. For the Mayans this is about survival, survival from human-made systems. With mining, land grabs, political maneuvering, and military intervention, the people of Mesoamerica are under attack. They are being pushed out of their lands and being put into a capitalist system that is a recipe for poverty creation. There were several concepts that stood out in the “2012 The Mayan Word” documentary. 1) Reconnecting with our Mother (the earth) is our largest challenge. If we can do that in 2012 then we deescalate the damage that we are doing. 2) Catering to corporate interests are to blame for the re-allocation of lands in much of Mesoamerica. Mining for gold and other minerals plus large agri-business is the pushing indigenous inhabitants into cookie cutter cubicles of houses that force them to live a city life where they have to pay for things instead of creating their own subsistence via the land. 3) By allowing corporations to create landfills of non-decomposing waste and by pumping harmful chemicals into the air, this is part of an air privatization process. The same is happening with drinking water that is becoming less and less safe. I’m glad to see that Mesoamerica is organizing and speaking up to try and stop what happening in their region and helping us all understand our true connection with our environment. This entry was posted in Activism, Privatization, Video and tagged 2012, Calendar, Civilization, Environment, Justice, Mayan, Oppression, Organizing, Protest. Bookmark the permalink.